Lenovo show their engineering prowess with this compact high-end computing workstation by producing the world's smallest Dual-Socket LGA2011 Workstation.The Lenovo ThinkStation C30 offers fantastic value not only at the time of purchase, but through it's energy efficient design. Supporting up to 2x Intel Xeon E5-2600 V2 Twelve Core Processors, the Lenovo ThinkStation C30 may be small, but still packs a punch. Up to 256GB ECC Registered RAM can be configured in this quiet mini-tower allowing you to power through any complex or rendering tasks. SATA and SSD drives are natively supported via the onboard RAID Controller (RAID 0, 1 & 10 available), and an array of nVidia and AMD professional graphics card options are supported by the installed 800W 80-Plus Gold Power Supply. Demanding deadlines in design industries are ever present and Lenovo know this. It's not enough to know that your workstation will just run your software, you need a workstation primed for your work. HP ISV certifications with many major applications such as ANSYS, Dassault and AutoDesk ensure that your machine is not just capable of running these applications, but is able to power through every feature available. 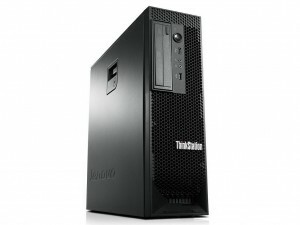 Stocking a huge array of system components allows Bargain Hardware to provide you with the choices you want when configuring your refurbished Lenovo Thinkstation C30. From Quad Core to Twelve Core processors and from Quad Head graphics cards to SSD storage options, our configure-to-order system puts you in control!